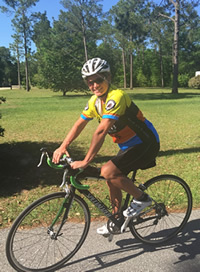 To celebrate her 50th birthday, Diane Lea will ride her bicycle 50 miles a day, for 50 days, to promote awareness for 50 different Causes! Each day of the Ride will spotlight the specific Cause for that day. The Ride begins 6/18/16 in San Diego, CA and ended 8/20/16 in Pensacola, FL. 50 Causes Ride will be an Annual Event! Stay Tuned. We are cycling to promote awareness and encourage action for these 50 Causes. A little over two years ago I was thinking of what I might do for my upcoming 50th birthday and as I was narrowing down my options, I decided that I really wanted it to be a “Reverse Birthday” and do something for other people. The 50 Causes Ride is my birthday gift to others. Preparing for this Ride has been challenging in many ways and continues to be, but I am so excited and honored to be able to do this.